The Day of the Dead is a rich, complex tradition. So, one of the best ways to share it with children is through stories. Las almas de la fiesta y otros cuentos de Día de Muertos communicates the significance and beauty of the celebration remarkably well. This Día de Muertos book is a treasure. 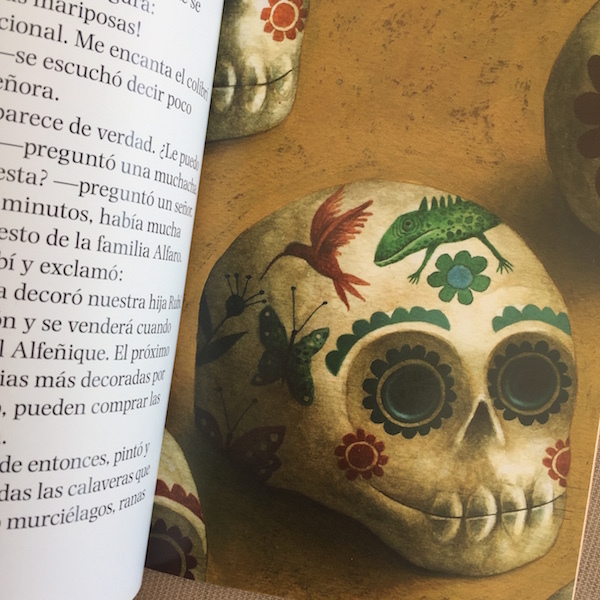 Las almas de la fiesta y otros cuentos de Día de Muertos is available from Cuentology. Cuentology offers a wonderful collection of children’s books from Latin America and Spain. They have, for example, board books, picture books, beginning readers, and chapter books. 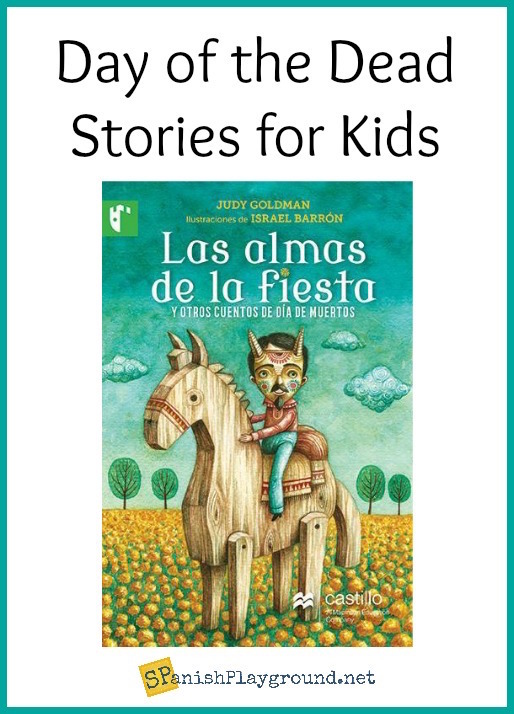 Las almas de la fiesta y otros cuentos de Día de Muertos is by award-winning author Mexican author Judy Goldman. This Día de Muertos book is an excellent example of the quality titles available from Cuentology. Be sure to check out our booklists and more Spanish books for kids. Las almas de la fiesta is a collection of stories, each full of love and tradition, firmly rooted in modern reality. Taken together, this Día de Muertos book creates a remarkable picture of the Day of the Dead. With strong characters and intriguing story lines, these stories capture the attention and the hearts of young readers. For example, Nico y Bazu, is about the love between a boy and his dog, and the inevitable loss when a pet dies. Azúcar blanca, tells the story of Rubí, who proves to her family that she has mastered the art of decorating sugar skulls. In the title story of this Día de Muertos book, Las almas de la fiesta, Rodrigo and his family are worried. His father crossed the border to the United States, and they have not heard from him. So, on Nov. 1, as the souls of the deceased roam the town, Rodrigo goes looking to see if his father is among them. Following each story, this Día de Muertos book explains of key elements of the Day of the Dead. These one-page descriptions are exceptionally clear and well-written, and the tone compliments the stories. For example, in Nico y Bazu, Nico’s father grows cempasúcil. Following the story, there is information about the history and significance of the flor de veinte pétalos. In addition, after Azúcar blanca, you learn about el arte de alfeñique and sugar skulls. Likewise, after Las almas de la fiesta, the author explains la ofrenda nueva. Through a combination of tone and masterful storytelling, this Día de Muertos book captures the Day of the Dead in a way I would have said was impossible. Love, an appreciation of life, and a rich understanding of death rooted in tradition, all come through. The stories are touching, with delightful characters and rich content. I am confident you will not find a better way of communicating the traditions and values of the Day of the Dead to children than this Día de Muertos book. So, add Las almas de la fiesta y otros cuentos de Día de Muertos to your home or classroom. I guarantee it will find a place in your heart. © 2019 Spanish Playground All Rights Reserved Created by Meks. Powered by WordPress.